Rudi Putra and his team stand in a remote area of dense jungle on the Indonesian island of Sumatra. The area holds some of the richest biodiversity in the world, and it's an environmentally protected zone under Indonesian law. Two police officers stand nearby, smoking cigarettes, rifles slung over their shoulders. That's when Putra gives the signal to rev up the chainsaws. A biologist by training, Putra is cutting down oil palm trees that were illegally planted in Gunung Leuser National Park, a protected zone in northern Sumatra, by unsavory companies whose plantations surround the park—and who are determined to maximize their share of the global palm oil market regardless of the law. Indonesia's “green warrior” gestures to a tree, and his hired man slices through the trunk. The palm wavers. Putra gives it a firm push, and it comes crashing down. 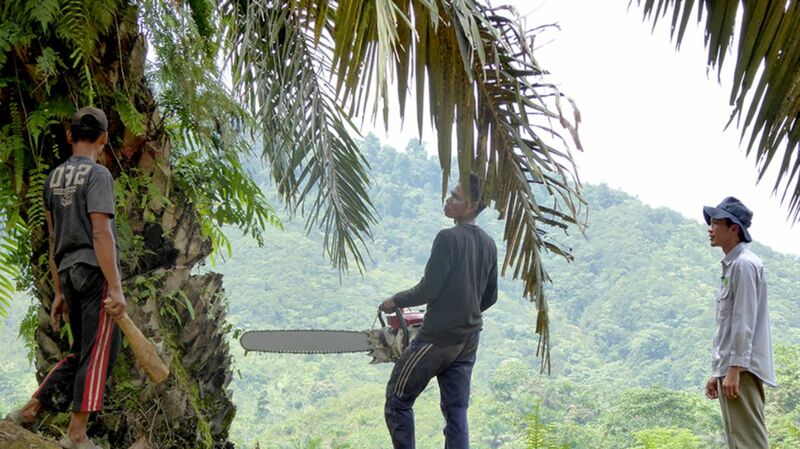 The men cut down palm after palm, destroying a valuable commodity crop that dominates—and destroys—Indonesia's landscape. In the past six years, he and his team have dismantled 1200 acres of illegally planted oil palm trees in the Leuser. The first area Putra cleared, in 2009, has naturally regenerated with native tree and plant species. Within four years, orangutans—critically endangered in Sumatra—returned too. And in the process, Putra, 38, has become a global eco-hero who recently won a prestigious Goldman Prize for environmentalism. Only half of Indonesia's original forests remain, and a major culprit for the ongoing deforestation—an estimated 2 million acres of forest disappear every year—is the global demand for palm oil. Indonesia is the world's largest producer of the most widely used vegetable oil on the planet. Palm oil is everywhere: in shampoo, lipstick, pizza dough, soap, biodiesel—even in chocolate. It's been illegal to clear forest in Indonesia since 2011, but political corruption means many turn a blind eye toward illegal plantations. That's why, in the mid-2000s, Putra decided that if the Indonesian government wouldn't enforce the law, he would. With the help of oilman-turned-conservationist Mike Griffiths, Putra assembled a team of young conservationists and armed them with smart phones and GPS software. These field monitors compare real-time data with maps of concession zones to determine which companies are overstepping their plantation boundaries. He enlists local communities, politicians, and police chiefs—many of whom at first called him "the crazy man" for daring to take on the powerful plantation companies—and then visits the offices of the offending palm companies. More often than not, the CEOs quietly agree to stop the illegal planting. That's when Putra and his team pick up their chainsaws. As governments around the world spend millions on reforestation projects focused on planting new trees, Putra's chainsaw environmentalism is an example of a low-cost, low-tech tactic that works. Maybe sometimes the most effective thing we can do is to make room for nature to take its course—and then leave it alone.